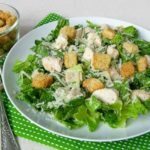 A salad made with grilled chicken, romaine lettuce, Parmesan cheese, croutons, and a homemade creamy Caesar dressing. Add all dressing ingredients except olive oil to a blender. Turn on the blender and slowly pour in the olive oil as it is blending. Blend until combined and the oil is fully incorporated. Heat a grill pan over medium-high heat. As the pan is warming, place the chicken between 2 sheets of plastic wrap and pound until about 1/2-inch thick or a little less. (The thinner the chicken, the faster it will cook). Remove the chicken from the plastic, coat with olive oil and season with salt and pepper. Add the chicken to the heated pan and grill about 4 to 5 minutes on each side or until chicken is browned and cooked through. Transfer the chicken to a cutting board. Allow chicken to rest about 5 minutes then cut into bite-sized pieces. If the romaine lettuce is not pre-chopped, chop it and place it in a large bowl. If pre-chopped, add it to a large bowl. Sprinkle some Parmesan cheese over the lettuce. Add some dressing and toss to coat the lettuce with the dressing. It is best to add a little at a time to avoid adding too much. Transfer the lettuce to plates. Top the lettuce with chicken pieces, croutons and some additional Parmesan cheese. Serve immediately. Alternative Method: If taking the salad to-go, do not toss the lettuce with the dressing. Pack the dressing and croutons in separate containers and add them to the salad prior to eating. Also make sure the chicken is cooled completely prior to adding on top of the lettuce (or pack it separately).